Just because your mouth may not hurt, does not mean it is healthy. People with HEALTHY gums should go to the dentist twice a year. Most people do not. If your gums are NOT healthy, you should go even more. People tend to spend around 2-3 minutes total brushing per day, even though proper oral care requires at least ten minutes of brushing and flossing each day. Kids tend to spend even less time than adults. Chewing gum or mints is not going to cover up the smell from smoking cigarettes. This is because the smell is deeply ingrained in the mouth and gum tissues. Most dentists won't tell you if you have halitosis unless you ask. People need to floss since brushing does not go deep into the gums. If a person brushes and flosses properly, gets regular cleanings, and STILL has bad breath, then he or she should check into diet and health complications. Dentists may secretly blame parents when their kids' teeth go bad. Cavity-causing bacteria CAN be spread from person-to-person via saliva. This includes parents to children-- if a parent tastes a baby's food, and puts the same spoon back into the baby's mouth, the baby is at risk. 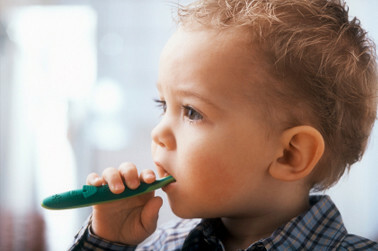 Children with dental problems, like toothaches, tend to have more problems in school. There's a significant risk of infection with any kind of mouth piercing if it is not performed in a sterile environment. Also, tongue piercings tend to chip the front teeth. Having metal fillings removed can release more mercury than leaving them in. Metal fillings are much more durable than tooth-colored fillings. People are exposed to more radiation standing outside for an hour than they are when they have dental X-rays taken. People are getting teeth pulled that don't need to be just because they can't afford to fix them. Teeth that are not aligned correctly can cause migraines. Bleeding gums is one of the first signs of diabetes. Did you know that teeth get whiter when they dry out? If you go to the dentist to get your teeth whitened, and your mouth is left open for an hour, the teeth could be two shades whiter from dehydration alone. Cosmetic dentistry only works in a healthy mouth. Always treat your gum disease first. When you go to the dentist, check to see if the magazines in the waiting area are up-to-date...this shows if they pay attention to detail.